New home - what to choose? I'd be looking for a new home and could have possibility to change some in cabling hopefully. Currently I'm thinking what to go for in broad field of home automation. I'd like to choose a way that can act on lights and switches, but also be independent from 'smart' insallation, so when I remove it everything works fine (or if something with domoticz or antyhing else is broken, lights and manual switches would still work). Also I'd totally love not to use WiFi/other radios in places I can have cables in, so it can't be intercepted and disabled with stronger signal. Do you have any ideas on what to choose? I would probably go with KNX or something similar if I was to build something new, with full automation. It's supposedly an open standard for building automation. as @tbowmo said - I would also run ethernet cables to all rooms from a central place. Once there you can choose whatever in the central point and be able to use the cables in different ways, either as a normal network or just cables for sensors. @filipq Why? Simply promoting a commercial product in an open source community is usually NOT the way to go. Sorry you are right. Just wanted to mention this product as I'm using it together with MySensors , Domoticz and esp8266 and works very well. @filipq could you expand on what works well, and why it is your "weapon of choice"? Since you have experience with Loxone you might have some important insights and experiences to share. Loxone and KNX/EIB are considered 'expensive' by me. I'm looking more for a way to use system like this but without complicated expensive installations. I'm looking also for some other ways to control everything without using loxone/knx. It's been a while of hard work for me with reading about the electrical wires installation etc. for sure KNX is too expensive for me to consider at this moment, although method I chose will be KNX-proof for future. the only way to meet the requirements of: easy external (not by me) service, work even without computer/domoticz hang etc./future-proof is to run wires from every switch and socket I want to control to central cabinet and switch it from there. run LAN/cat5e cable to each socket for future KNX proof installation or running any arduino there instead of typical wall switch. So if I enter room and want to switch light, I just press a doorbell-type switch on wall, which will put an impulse to central cabinet (using 230V) and switch there will turn the proper light on. It is both: easy to service for external serviceguy if I would be away and some module is dead and also it will be able to work without ANY automation software/hardware further. Also, doorbell-type cabinet switches are possible to control externally. to securely control bistable switches I want, with optoisolation using ie. MQTT and HomeAssistant. The only question left is: how to know what is the status of each light/socket managed by bistable relays? If I turn on something via homeautomation and turn it off by hand on wall-switch, how to monitor them? The only way I manage to consider is using stairway-like switch (so managed from both sides of power line) instead of doorbell bistable one. But then switch on wall would be once on, once off in different positions. Any other thoughts? What do you guys think about the idea described above? 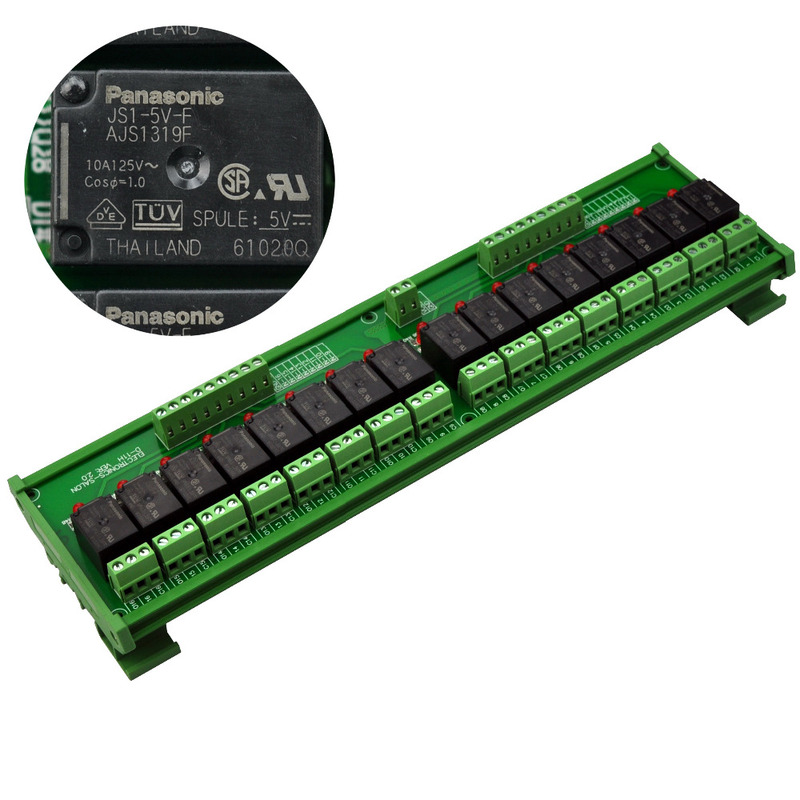 Electronics-Salon DIN Rail Mount 16 SPDT 10Amp Power Relay Interface Module, DC 5V Version.